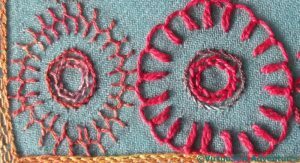 Always like reading your blog to know the names of stitches. Very interesting. I will miss Dreams of Armana when you finish it, even though I want you to stitch faster so I can see more. 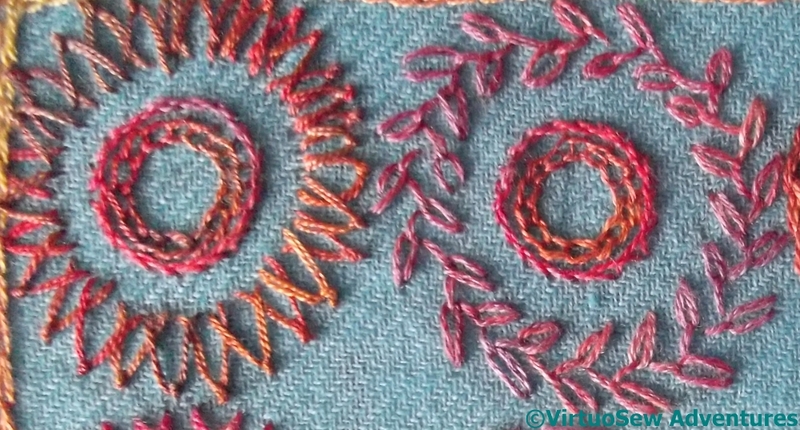 Love the feathered chain stitch! Dreams of Armana could be one of your 17 in 2017!! This is looking nice. I love up and down button hole stitch. Seeing it here makes me want to use it again. Wonky stitches are the best! Italian border stitch is new to me. I like the Cretan in particular, it looks like a lot of happy people dancing in a ring. 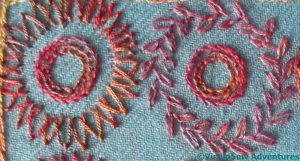 Chained feather stitch circle looks good.I use petal and single feather stitch a lot around shisha and I think this one will work too. As always, fascinating to see how different stitches behave, especially round curves.